Technology growth has not only opened doors of opportunity, but has also mandated that effective IT policies be created, implemented and managed intelligently and proactively. How do you ensure proper network defense and actionable incident responses? In other words, how do you effectively reduce risk? It comes down to one word. "POLICY". A comprehensive acceptable use (ATU) policy should allow your company to monitor activities on a granular level as well as to plan for anything that could potentially happen in the future. 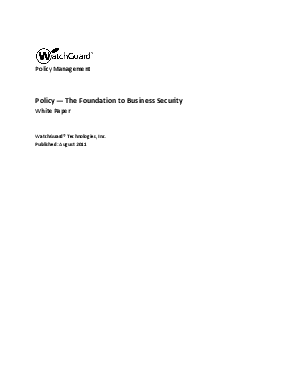 This is the foundation to business security. This white paper addresses the basic AUP businesses should have in place for their social media needs to stay ahead of threats.